For Valentine’s Day I thought I would post a couple of “love” scriptures for you. I pray these will sink in deep today, for you are dearly loved. Grady and I are deeply in love – the Lord has truly blessed our marriage, but today during my quiet time after thanking the Lord for this great marriage He has blessed us with, I sat and thought on the love Christ has for me. It is a love stronger, deeper, wider, and longer than any earthly love we could ever know. Would we look up today and see the banner that has been firmly set over our us – it’s not a banner of shame, or disappointment, or condemnation – but a banner of love. Let Him take you to the banquet hall today and allow you to see the banner He has placed tenderly, lovingly, and sacrificially for you. 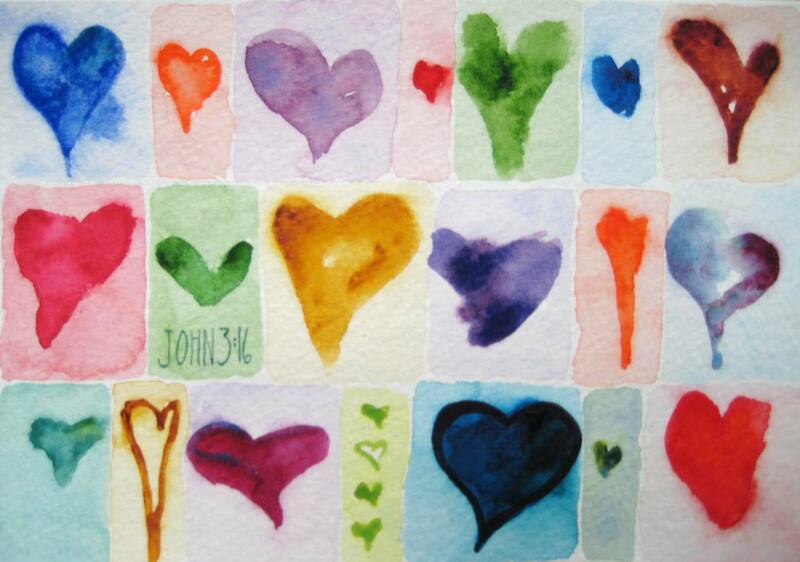 This is a Valentine card I painted for my Mom. my goodness i love that card. i really enjoy your artwork. Thank you for reminding us that His love is stronger than any earthly love. What a comfort to think of His banner of love over me! I love your work and I love you girl!! I’m glad this spoke to you friend! I love you too!